I had been to SJCE last weekend to conduct internship interview for the current final year engineering students. The turn-up was much less than expected. We went quite late this year and many students were already offered projects in other companies. Also we had a cut-off of 70%. About 40 students took the written test. We short-listed 13 and ended up selecting 3 students. All 3 were from Information Science. We had expected 120 students to turn up and we were planning to select 9-12 students. Congratulations to those selected. And a suggestion to those who were not: It is not the number of companies that you are placed in that matters, nor is it the pay. It is your fundamentals that will take you a long way. Don&apos;t blame the company if you are not offered a quality job. Ensure that you have what it takes to get one. Two of my colleagues and friends Vamsi & Shiva, who are committers on Apache Geronimo will be conducting training sessions at ApacheCon US 2007 / OS Summit Asia 2007. Setting up the Eclipse IDE for Java EE 5.0 App Development on Geronimo v2.0, including starting/stopping of Geronimo server from within Eclipse. Developing a simple Java EE 5.0 application from scratch (consisting of a few JSPs, Servlets, Session Beans and JPA Entity Beans), and deploying and testing it on the Geronimo server. Adding MDBs and WebServices into the above application using Eclipse WTP v2.0 tools. Debugging Java EE applications using Eclipse. Attendees will also compare their newly developed Java EE 5.0 application with an equivalent J2EE application, and left appreciative of some of the newest features brought by Java EE 5 (like Annotations) that greatly simplify enterprise application development. The attendees will learn about the prerequisites for various security realms provided by Geronimo, the choice of data stores (Simple Text Files, LDAP, Database, Digital Certificates) they have for user credentials, how to create security realms to authenticate users using the data in these data stores, configure Web/EJB/EAR application security and enable advanced features like Principal wrapping, Single-Sign-On, Auditing and Lockout. After completing the training, the users will be in a position to decide what best suits their development/deployment needs, create security realms and create necessary deployment plans to secure their applications using the realms. Hurry up and register soon. There is a discount on the registration fee if you register before 22nd October 2007. 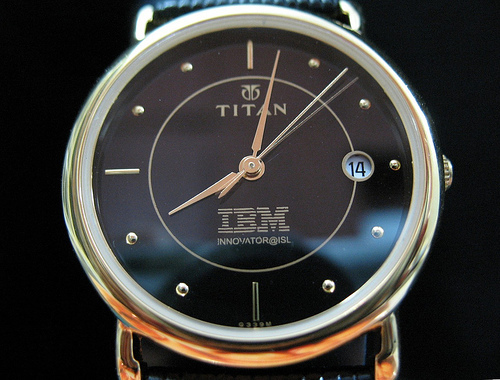 I received this watch as an award for my first patent disclosure. Thank you ISL! I had been to college today for the ISL Internship Interview. 3 of us (me, Kulki and Suresh) left early morning, each with only 4 hours of sleep last night. We left early morning at around 6:30 and reached by 10:30. The process comprised of a written test followed by interview for short-listed candidates. We ended up selecting 6 students. It was not an easy job! I felt really bad looking at the sullen faces of the students who were not selected, especially when I realized I was part of the decision. But then destiny plays its role and I guess we made the right choices. Thanks to all the co-ordinators. In all, it was a nice (although tiring) experience. I had been to college today to deliver a talk on behalf of ISL. The talk was on &apos;Innovation at IBM&apos;. The talk was jointly delivered by me and Tariq Aftab. We spoke about RFID, IBM Everywhere Interactive Display and IBM Smart Surveillance System (S3). It lasted for about 1 hour 15 mins. Overall, the response was good (the auditorium was jam-packed) and there were questions (which means people understood what is going on). Ananth Narayan from LTC also accompanied us. Ananth is also an alumnus of SJCE. We then had the privilege of meeting the principal, the head of the department of computer science and several other lecturers. It was good to be back in college after such a long time. The atmosphere was pleasant and I felt I am really missing college. Overall it was a satisfactory mission. ISL Fusion Funda was the annual cultural event organized in Nimhans Convention Center on 26th November, 2005.